In today’s post: I’m sharing a copycat Olive Garden breadsticks recipe that’s even better than the original! Hey, thanks! 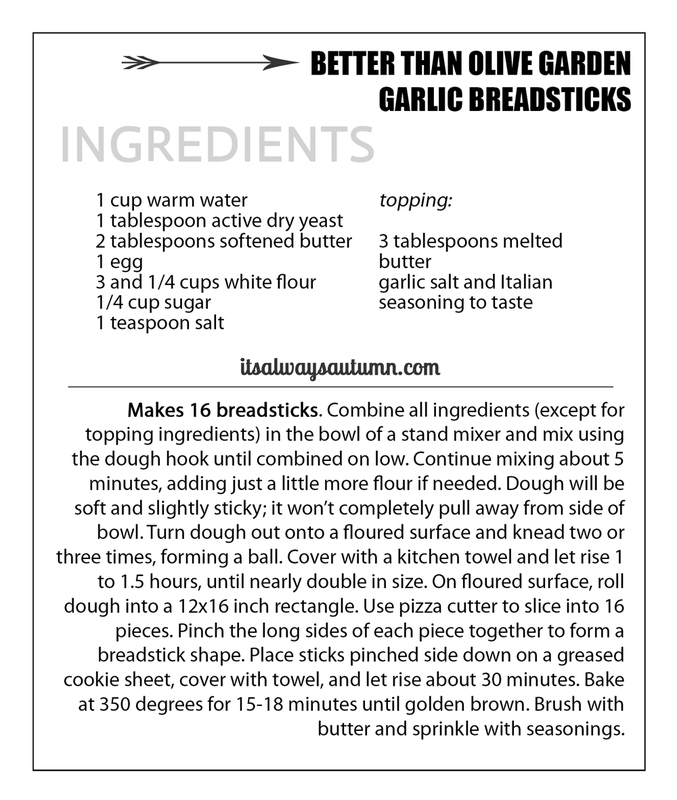 I first published this recipe over four years ago and many of you have reported loving these breadsticks. My children beg me to make these better than Olive Garden breadsticks as often as possible and everyone is thrilled when I serve them. 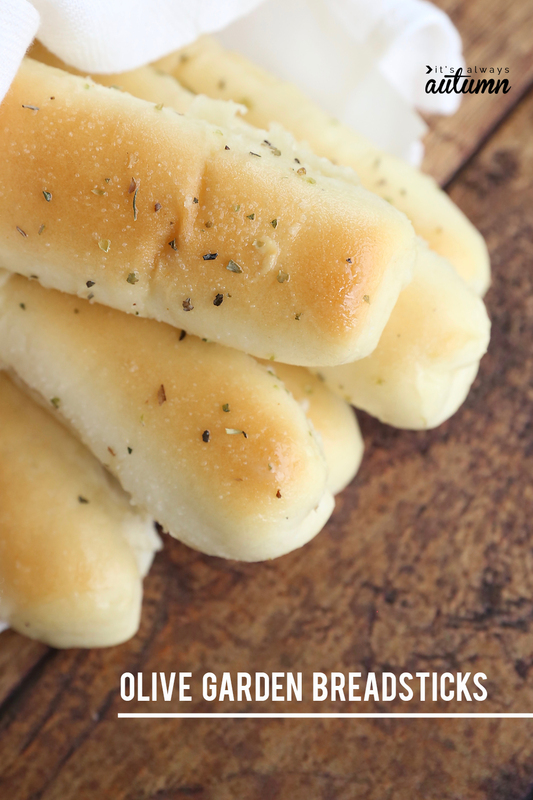 Seriously, warm, soft breadsticks will cheer up even the grumpiest teenager. I know making homemade bread can be intimidating, but these really are not hard! You’ll need to start them about 3 hours before you want to serve them, but the hands-on time is actually pretty minimal. If you’ve never made bread before and are nervous about the kneading, etc., click on over to this post – The Best Dinner Rolls – and watch the instructional video. It will walk you through every step of this recipe. The only difference is that video will show you how to shape the bread into rolls, and in this post I’ll show you how to shape the dough into breadsticks. Grab the printable recipe card you see below by clicking here. Again, if you are unfamiliar with making bread, you can watch the instructional video in my dinner rolls post to get step by step instructions for kneading the dough and letting it rise. The first rise generally takes 60-90 minutes. 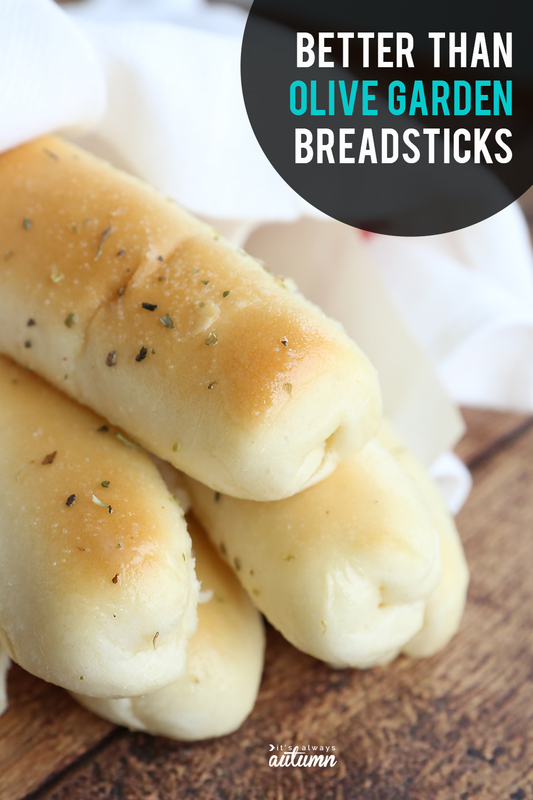 NOTE: the step above ensures you get a very smooth, round breadstick. 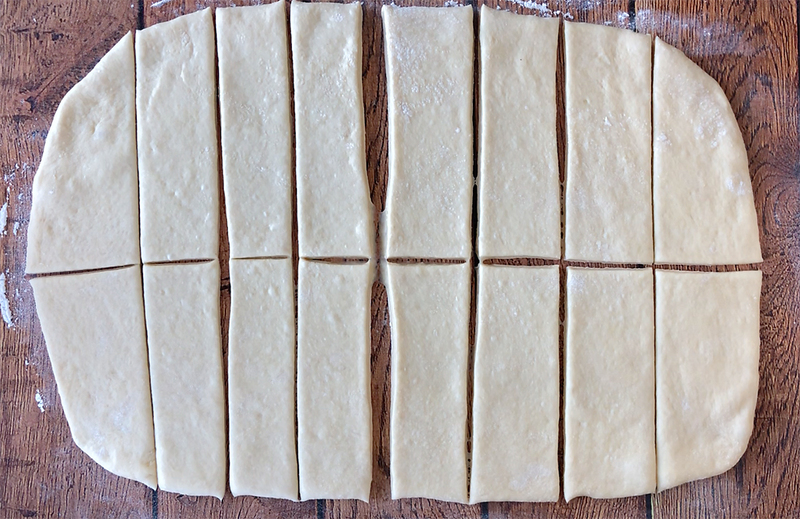 If you’re not worried about having a perfect shape, you can just roll your dough out into a smaller rectangle, cut it into 16, and skip the shaping step. After the second rise, place the cookie sheet in a preheated 350 degree oven and bake for 15-18 minutes until golden brown on top. Then brush the breadsticks with melted butter and sprinkle them with garlic salt and Italian seasoning (or whatever seasoning blend you prefer). Since these better than Olive Garden breadsticks are nice and buttery, I like to line whatever basket or towel I’m serving them from with wax paper. 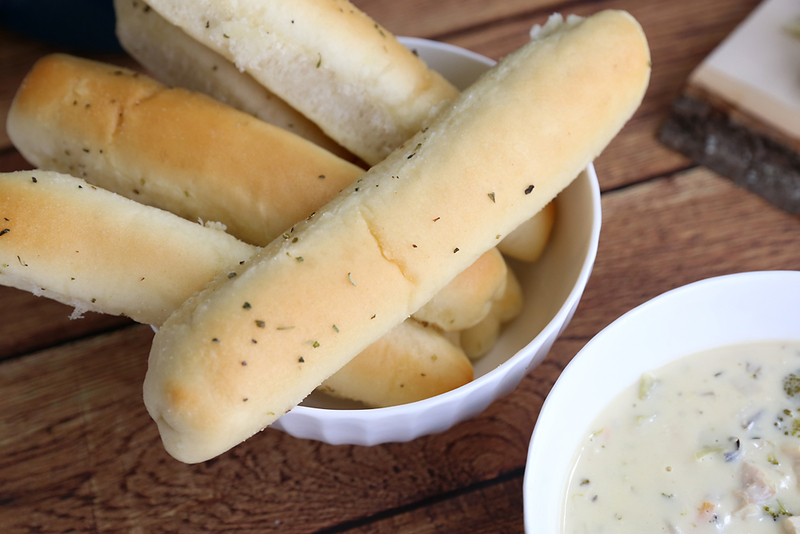 These breadsticks really are the perfect compliment to just about any meal (and divine with soup!). Try them with sweet bacon chili or creamy chicken and rice soup. They look so good. I am so starving already. I will make them and cover with olive oil and black olive cream. I don’t even know what black olive cream is – but it sounds delicious! I don’t have a stand mixer justly good ol hands. So should I proof the yeast? Nope! Unless you’re worried your yeast is old or something there’s no need to proof first – I’ve made these often by hand and I just start mixing everything up at once in a bowl with a wooden spoon. I usually do have to add a little extra flour when I’m kneading by hand to keep them from sticking too much – I just add it little by little and try not to mix too much extra in. Good luck! I’m actually at a pretty high altitude now and I’ve also made this recipe at lo altitude and haven’t had to adjust it in either place! These look incredible! Thanks for sharing! 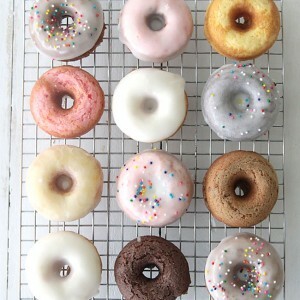 I only have one package of yeast but really want to make these now. 😉 My package says it has 2 and 1/4 teaspoons of yeast in it… will that be enough or should I wait to make this recipe when I can get more yeast? Hi Clara! You probably already decided one way or another – but if not I bet you’d be ok with using one package of yeast. The final product won’t be quite as light, but I think they’ll still be good! If I bake them the morning before they’re being served, do I dip right when they get out of oven or before I serve them?? Once they’re out of the oven wait until they are completely cool, then put them in a large ziplock bag. Then dip them right before serving – you could even pop them back in the oven for a few minutes to warm them back up. If you do that you’d probably want to wrap them in foil to make sure they don’t dry out. I have some going in the oven right now! I made these tonight. They were very good. Thank you for sharing the recipe. Hi, could I ask why the sugar?? Can I leave it out? Hi Amy! I’m sure you could decrease the sugar if you wanted, but I wouldn’t leave it out completely because I know sugar helps activate the yeast (maybe try only 1 tablespoon or something). The breadsticks don’t taste sweet with the sugar, but I think it helps round out the flavor. If you give it a try with less sugar, let me know how it works! Thanks for sharing. 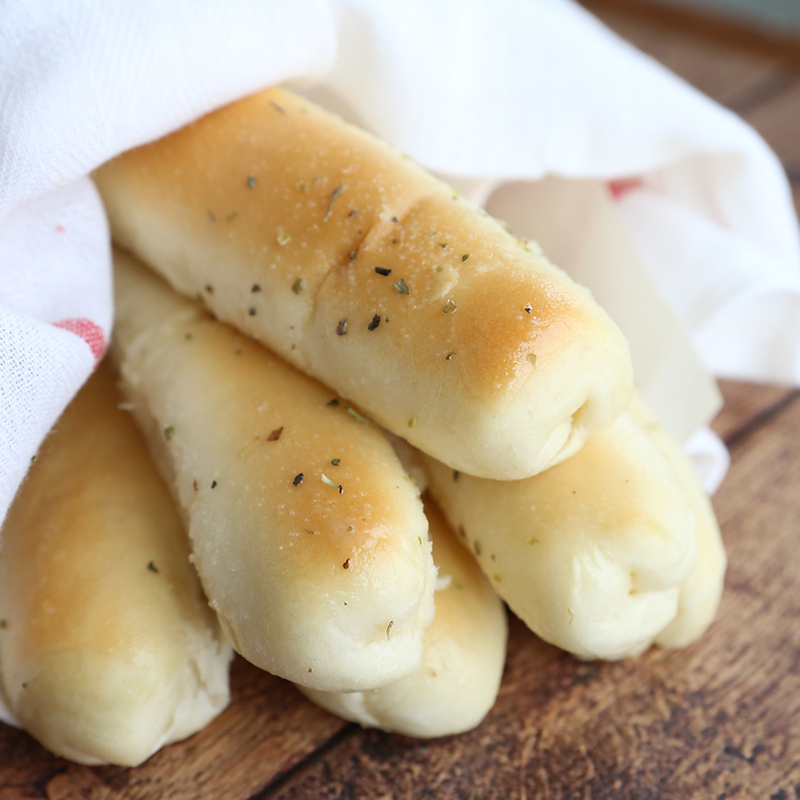 These are my go to breadsticks. I’ve made these many times having friends over and all our kids keep asking for more and will even have them for ‘dessert’. We never have any left. I’m making a batch now too. Thank you! For some reason mine are super dry. I had to add an extra 1/4 c of water and they still aren’t at all sticky. I was afraid to add to much. They’re rising now so we’ll see, but I’m kind of afraid the texture will be off. I’ll update in a little while! Let me know how it goes – I bet they’ll be just fine! It’s really hard to get exact flour measurements without weighing flour (which I’m too lazy to do). Next time you can try adding less flour to start with. Anyway, definitely update me – I have my fingers crossed for you! They were a hit while they lasted! It’s probably the type of flour I used. I forget what its called but it’s supposed to have the nutrition of wheat but the texture/usage of all purpose. It isn’t white wheat, its finer than that. I had to get up and look, it was bugging me! Ultragrain all purpose. Anyway, its a keeper! I’m trying the french loaves tomorrow! I had planned to make the crock pot lasagna but I didn’t get started in time so I just made pans of traditional using the recipe/ingredients I had jotted down from here. I found this via pinterest. Made a half batch of them this eve. They were simple to do, and turned out great. They are better than olive garden. These are very light and fluffy. Like pillows. Seriously great. Last time I was at olive garden the breadsticks were tough and chewy. Again, these are much better. I did add some extra garlic powder on top of them after I brushed (rather than dip) on the butter/garlic salt mix. Thanks for a great breadstick dough! i never ever write reviews but i had to write one for this recipe. 3 Words: Finger-Lickin’ Deliciousness! everyone loved those bread sticks and they were so easy to make! and they all said those r better than olive garden. i served them with 3 dips: Olive paste, Pesto, and Salsa. Yummy. Thanks so much, Shaza! I think these would be amazing dipped in pesto – I’ll have to try that soon! Hi Autumn, I’m really excited to try these, but I’m gluten-free. I’ve been using almond flour recently, but I’ve only tried it in two recipes and it seems to make things really “heavy.” Would you have any insight into whether almond flour would work with this recipe? Or perhaps another gluten-free flour? 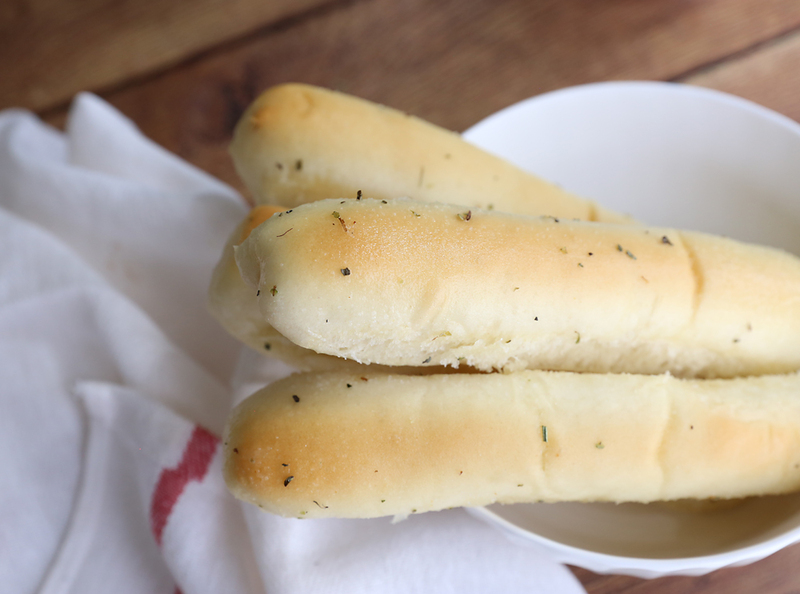 I’m a total breadhead, and I’m absolutely dying for some breadsticks! Thanks in advance! Oh, Sara, I have absolutely no experience with anything gluten free, so I’m no help at all. 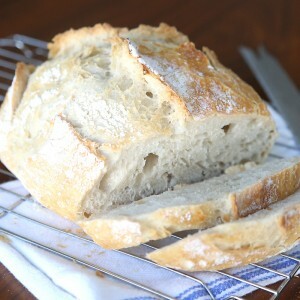 I know melskitchencafe.com sometimes posts gluten free recipes – maybe she has a good gluten free bread recipe? Good luck! May I ask what type of yeast you use? I have Active Dry Yeast, but I’ve seen some recipes call for different amounts of yeast, depending on if you have the active dry vs. instant yeast. Thanks! I still haven’t been able to determine whether you used dry active yeast or instant yeast. Please reply, thank you, as I want to make these delicious looking bread sticks. Hi, I use active dry yeast but instant will work fine too! I tried this recipe today and let me tell you it is fantastic. I shaped the dough into dinner rolls and they turned up perfect! Thank you so much for the recipe, it’s a keeper! Hi, I am in UK and I wonder what flour I should use, we have plain (no raising agent), self raising or bread flour(also known as strong flour)? I just use all purpose flour, which doesn’t have a raising agent added, so I suppose that would be plain for you – good luck! yes they worked with plain flour, absolutely delicious. I make them all the time now and my family love them. 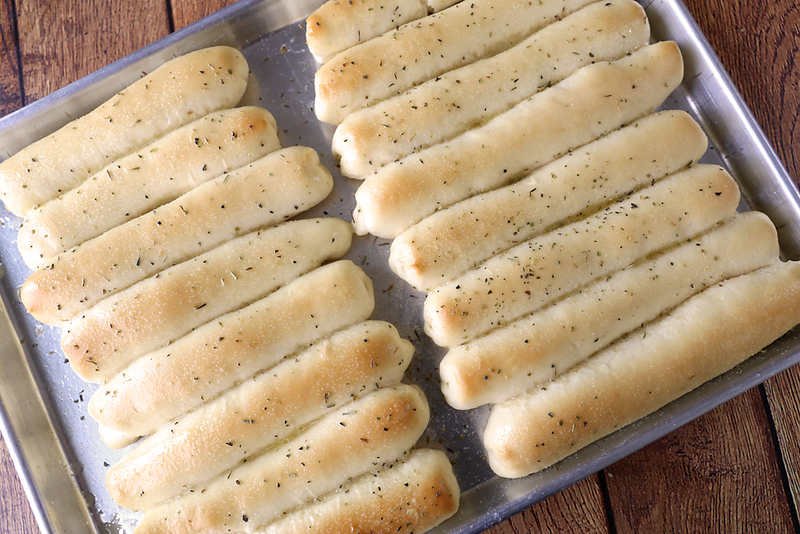 These are the BEST breadsticks!! My whole family loves them! We can’t get enough! These are amazing!! I think I ate about 6 while I was finishing up my spaghetti! Good thing it makes a ton so nobody realized i was such a piggy in the kitchen lol. Making again tonight. 🙂 Thank you!! Yummy! I used my bread machine on the dough setting and these turned out great. Thanks for the recipe! Ty for posting. I was debatung using the dough setting on my bread machine. Looks like I am. i made these three times and they turned out great. I tried them at my daughters house and they rose ok on the first rise but not on the second. I forgot the salt on the last batch. Any ideas what I did wrong? The dough seemed stiffer also with the same amount of flour. I use King Arthur all purpose and spoon flour into measuring cup and level off. Thanks for a reply. Just like everyone else my family and I thought these were the best bread sticks ever. I also made loaf bread with the recipe and it was very good. The recipe made two small loaves. Thank you for the recipe. I LOVE this recipe! Thank You! I always get rave reviews when I make these delicious breadsticks! I have been making these for awhile now and just started feeling guilty that I’ve never commented about how amazing these breadsticks are! They seriously are BETTER than Olive Garden’s, and I had some serious Olive Garden fans that were major skeptics of the claim! 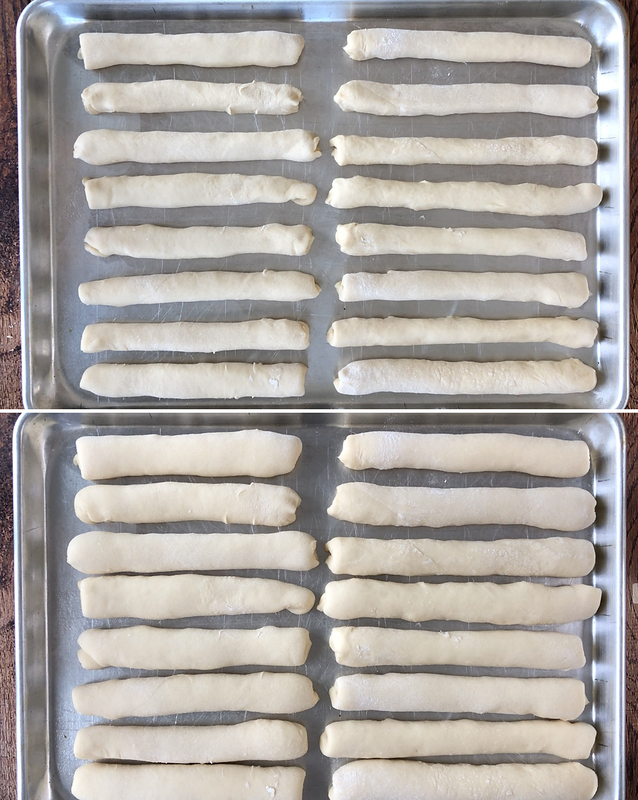 It is the ONLY breadstick recipe we use now and I make them almost weekly. Now whenever I come across a recipe that was posted by you, I always know it’ll be amazing (and it always is!!!) This recipe was where it all began for me though, and we will never be the same. Thank you for sharing this gem!!!! Hi, Can this recipe be made ahead? 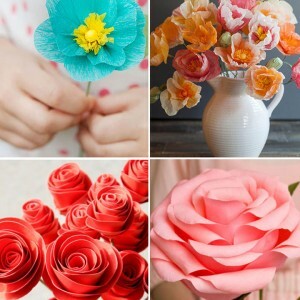 Can you make these and freeze them? If so would you bake them first then freeze? Thanks! These are just great! Light, crunchy….wonderful! I can’t wait to try these! Do you use instant yeast or regular active-dry? These are great !!! And so easy to make . Thanks so much for sharing this great recipe ! I know I’m late to the party, but I had to comment and let you know how much we love your recipe!! 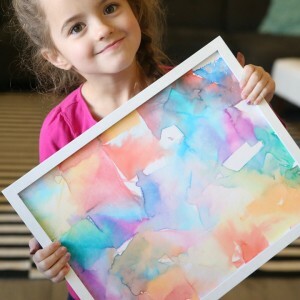 I’ve made them a few times now and they are so failproof! My kids adore them. We’re Aussie so have no idea what “the olive garden” is, so they call them the garlicky bread sticks. Mine never look as perfect as yours do but they still taste divine. I serve them with Cauliflower soup and they are the easiest and most perfect accompianment. Thank you so much! Making these with dinner tonight. I hope they come out as delicious looking as yours! I Made a small modification…basted the baked breadsticks with butter, garlic salt and Italian dressing . It adds some tange. I’ve been using this recipe for a few years now and I don’t think I’ve ever even left a comment! These are INCREDIBLE!! I always have to double the recipe because everytime I’ve served these for a dinner they are INHALED! There is never a breadstick left!! They always get rave reviews and people beg me for the recipe. It’s been a treasured recipe ever since the first time I made them. Thank you for sharing it!!!! After baking these can you brush them with the butter garlic mixture and sprinkle with parmesan cheese and pop them back in for a few minutes?